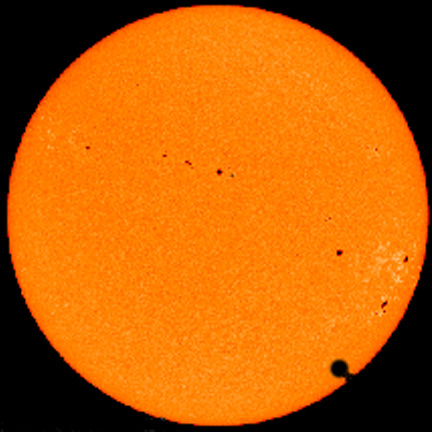 A transit of Venus --the movement of the planet across the disk of the sun--was well underway on June 8, 2004, when the sun rose in the eastern United States. Observers saw the waning minutes of the transit, the third and fourth contacts, the “black drop” effect, and other rare spectacles. Other parts of the world saw the complete transit, start to finish. Transits drive the search to determine our place in the cosmos, from historic expeditions to quantify solar parallax to NASA’s upcoming Kepler mission to discover earth-class planets around distant stars. This 2004 highlight was an excellent opportunity for the education community in multiple disciplines. Caution: You may safely view the next transit of Venus only if you use proper solar filters or a suitable indirect viewing technique. Do not stare at the sun without proper filters, even at sunrise or sunset, for irreparable eye damage may result. As an observational event, the 2004 transit was only moderately demanding. 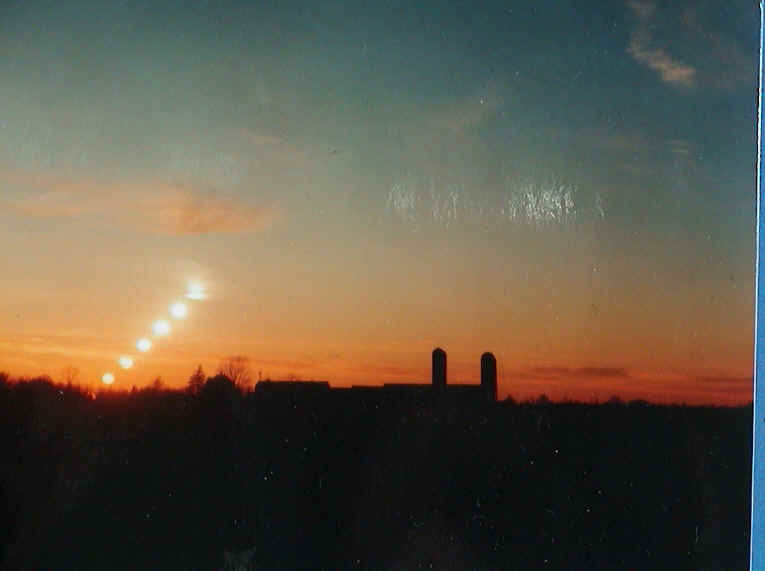 As seen from the eastern United States, the latter portion of the transit became visible at sunrise and lasted less than an hour. This required protective eyewear and telescope filters, a low horizon to the east-northeast, and clear skies. The chart at left shows the hour after sunrise as seen from the Great Lakes region (Venus not to scale). For more sunrise photos see http://www.transitofvenus.org/gallery.htm. Sunrise picture courtesy of Rick Pirko. Times for third and fourth contact, listed by city name, indicate when Venus touched the inside edge of the sun as it left the solar disk (third contact) and when Venus touched the outer edge of the sun after it had left the solar disk. Times are in Universal Time (UT). Subtract 5 hours to get Central Daylight Time (CDT) or Eastern Standard Time (EST); subtract 4 hours to get Eastern Daylight Time (EDT). 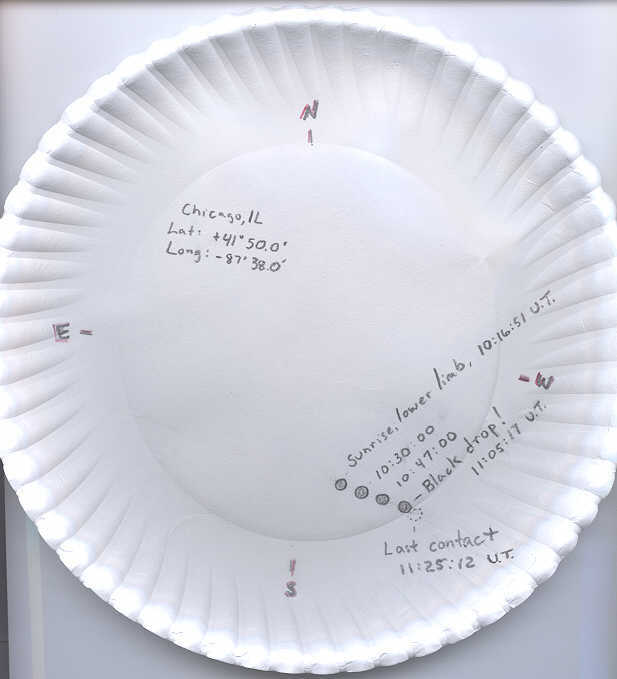 A recommended viewing tool was Gene Zajac’s modified version (see 1999 GLPA Proceedings) of a Sun Gun by Bruce Hegerberg. The device safely allowed a crowd of spectators to view a large projection of the sun, the transiting planet, and sunspots. 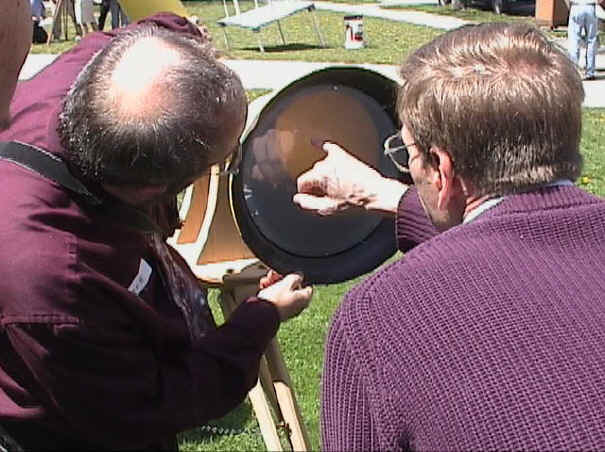 At left, Gene Zajac and Clyde Simpson easily track sunspots. 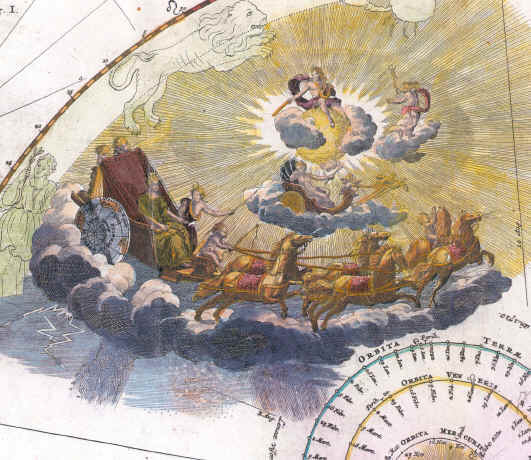 During the transit, one could track the path of the planet's disk as it glided across the sun, as Jeremiah Horrocks did for the first recorded transit of Venus in 1639. See the Transit of Venus activity. In the current epoch, transits of Venus generally occur in pairs--eight years apart--that are separated by over a century. Astronomy author and illustrator Jay Ryan described the circumstances that create periodic transits, reprinted here with his permission. The Transit Frequency activity illustrates the irregular periodicity of transits. In this paper plate model, daughter Venus and her mother Earth race around the sunny front door of a house. Out of shape mother jogs until either daughter runs by her five times, or mother runs eight laps around the house, whichever comes first. It's a photo finish! Who gets back to the starting line first, daughter Venus or mother Earth? June 8, 2004. 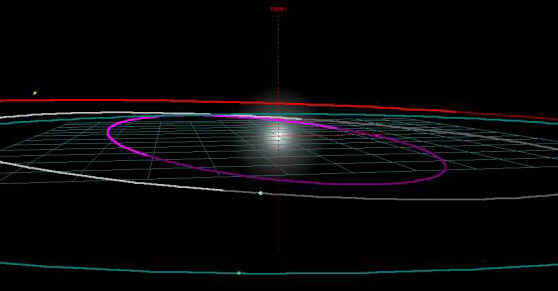 In a rare alignment, Venus passed directly between earth and the sun while Mercury was elsewhere on the inside track. No one is known to have seen the 1631 transit, the first in the era of the telescope, though Pierre Gassendi apparently tried. Jeremiah Horrocks and William Crabtree are the only two known astronomers who saw the 1639 transit, a first in recorded history. Their interest paralleled the astronomy community's pursuits of the day, which were more about determining the planets' apparent sizes than distances. Young Horrocks had noted a discrepancy between Philip Van Lansberg's oft-wrong astronomical tables which predicted a 1639 transit and Johannes Kepler's usually-reliable Rudolphine tables which did not. Based on his own calculations, Horrocks correctly predicted the transit circumstance and witnessed the last half hour of the sunset event. In 1677 Edmond Halley proposed worldwide expeditions to time a transit of Venus to quantify the distance (known as an astronomical unit, or AU) from the sun to the earth. Global efforts to time transits of Venus occurred for the 1761/1769 and the 1874/1882 transit pairs. During the transit, look for the infamous “black drop" effect at third contact, when the disk of Venus just touches the edge of the sun and begins the planet’s apparent egress from the sun. Near contact a meniscus appears between the planet and the sun, and circular Venus briefly elongates. Ultimately reducing the accuracy of the timing, the “black drop" effect becomes the limiting factor in determining the Astronomical Unit via transit timings. 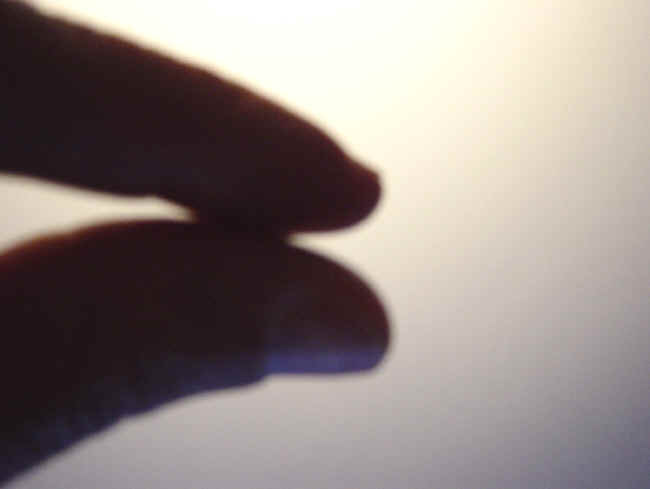 To simulate the "black drop" effect, almost pinch your thumb and forefinger together against a bright background. 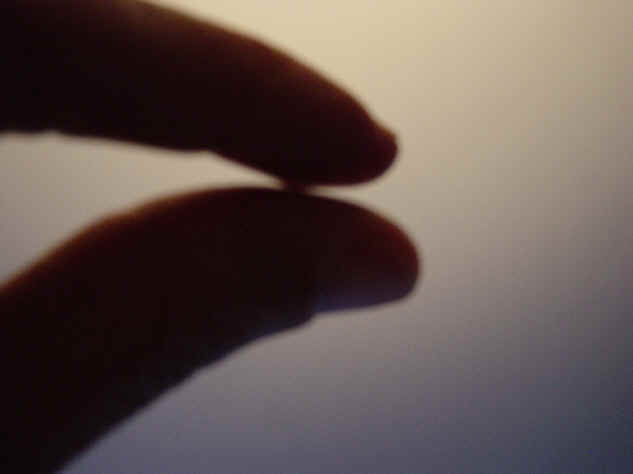 Near contact the meniscus between them appears. 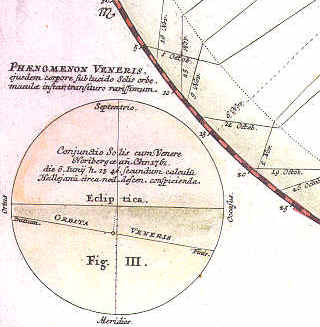 Venus passes between the sun and earth (far left); the path of Venus is predicted for the 1761 transit (left); from Johann Doppelmayer's Atlas Coelestis, 1742. The Kepler mission will search for earth-class planets around distant stars by detecting the repeated dimming of the star that can be attributed to a transiting planet. 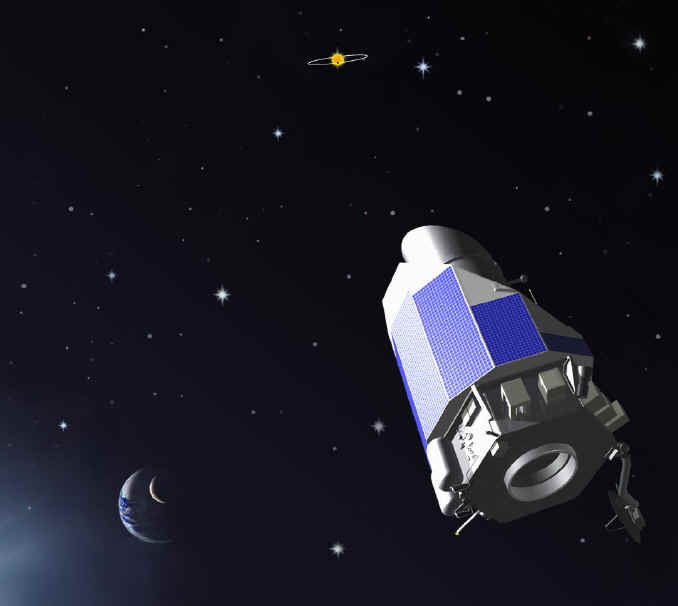 Make a paper model of the spacecraft, access images and animations, and find educational material at the Kepler mission website. While the lonely crew of the Endeavour may have extricated nails from the ship’s hull to barter for favors, Captain James Cook and expedition scientist Charles Green witnessed and recorded the “black drop” effect. 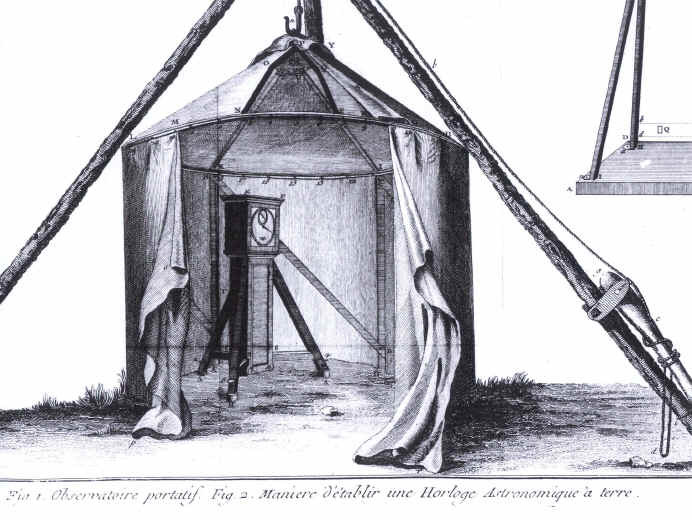 Captain James Cook's observation tent (one source claims this is a Tahiti field drawing from Cook's French Edition, 1769; another source suggests it is the observatory designed for Cook's third voyage). Washed out in New Zealand; from Illustrated London News, March 20, 1875. Transit of Venus photographic plate, 1882; courtesy of U.S. Naval Observatory Library. See more historic plates and descriptions from the USNO. If you could erase the daytime sky to see the background stars on transit morning, 2004 June 8, this chart shows what you might have seen. The foreground earth appears transparent, the sky is white. Venus is near final contact; Mercury is above the Hyades; Saturn is trailing the sun. Sun and planet disks not to scale. "Transit of Venus" graphic shows Venus approaching the sun's inner limb. At third contact, the "black drop" effect ultimately limits the accuracy of the transit timing. 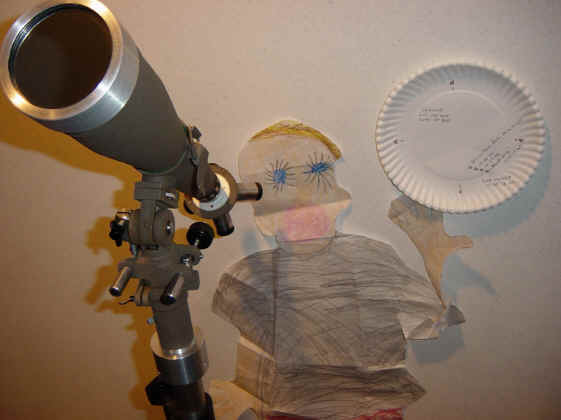 For educators, the transit of Venus is an educational opportunity in multiple disciplines. Though the transit is an astronomical event, educational programs can readily incorporate math, history, geography, and other subjects. For example, students can calculate the Astronomical Unit from their transit timings and then apply Kepler’s Third Law to determine the distances to all of the other planets. Babylonian and Mesoamerican cultures developed accurate calendars based on their observations of Venus. Other history lessons can tap into the international timing expeditions in context of 18th and 19th century world events. The scientific requirement to have widespread observing sites sparked ambitious voyages by daring explorers, yielding stories of adventure, hardship, defeat, triumph, and discovery. These dedicated explorers spanned the globe in international efforts to resolve a leading scientific question of the day. Consider the travails of Guilliame le Gentil of France, who also discovered the Lagoon Nebula (M8) and the companion galaxy (M32) to the Andromeda galaxy. Planetariums and museums in the United States broadcast live feeds of the transit beginning the night of June 7, 2004, in some U.S. time zones, though the transit was not visible in the eastern U.S. until after sunrise on June 8, 2004. NASA (see below), the European Southern Observatory (ESO), and others coordinated global transit timings that simulate the historic endeavors. "The NASA Sun Earth Connection Education Forum in partnership with the Solar System Exploration Forum, DPS, and a number of NASA space missions is developing plans for an international education program centered around the June 8, 2004 Venus transit...We will use a series of robotic observatories including the Telescopes In Education network distributed in latitude to provide observations of the transit that will allow middle and high school students to calculate the A.U. through application of parallax. 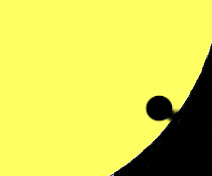 We will also use Venus transit as a probe of episodes in American history (e.g. 1769: revolutionary era, 1882: post civil war era, and 2004: modern era). Museums and planetariums in the US and Europe will offer real time viewing of the transit and conduct educational programs through professional development seminars, public lectures, and planetarium shows. We are interested in soliciting advice from the research community to coordinate professional research interests with this program." Lou Mayo may be reached at lmayo@pop600.gsfc.nasa.gov. We are pleased to announce a Toyota TAPESTRY grant has been awarded (March 2003) to establish a clearinghouse for transit of Venus resources. The information will be available to multiple users, including teachers, planetarians, librarians, and other educators. Details and content appeared as they were developed. The program, simply entitled Transit of Venus, is supported by a Toyota TAPESTRY grant, which is funded by Toyota Motor Sales, U.S.A., Inc. and is administered by the National Science Teachers Association (NSTA). The Project Director is Art Klinger of the Penn-Harris-Madison Planetarium in Mishawaka, Indiana. NASA's transit of Venus pages begin at http://sunearth.gsfc.nasa.gov/sunearthday/2004/index_vthome.htm. Check out Paper Plate Ed's caveat about believing everything you see on the Internet (including here). 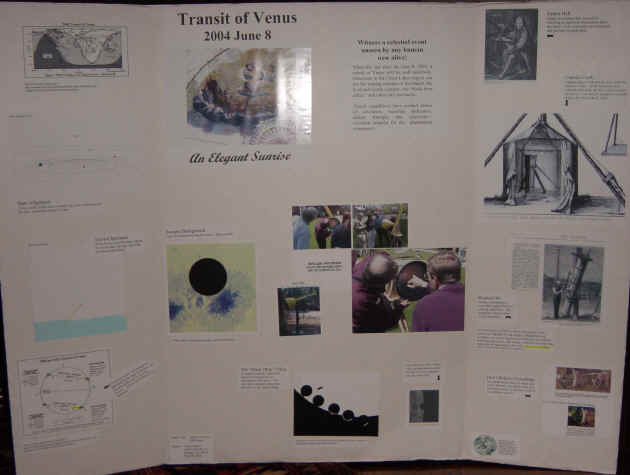 At the 2002 GLPA Annual Conference in Menasha, Wisconsin, Chuck Bueter displayed a poster about transits of Venus. The poster's text will appear in the 2002 GLPA Proceedings. References and other images on the 2002 GLPA poster were used with permission of Fred Espenak, Richard Pogge, and Greg Smye-Rumsby. Images on this page are by Chuck Bueter, unless noted otherwise. Corrections, criticism, and contributions of material are welcome.